So, the Critter’s Workshop P&E Reader’s Poll is still going, and votes are allowed for two more days (through Jan 14th) Have you voted on your favorites yet? This year, my poem Amber Day is in the Poems category. 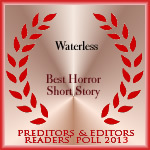 Have you checked out the Horror Short Stories category? If you’re looking to read something short, sharp, emotional and uncomfortable, might I suggest Sydney Leigh’s Baby’s Breath. You can read the story for free here, and vote for it on the P&E Horror Short Stories page. Enter at Your Own Risk: the End is the Beginning is included in the Anthologies category – my story Consequences was included in this one, and you can vote for the anthology here.